We Are Located South of "The Y" junction on Hwy 50, 1219 Emerald Bay Road, South Lake Tahoe, CA 96150. Now open for Winter 2018/19 - Mountain Mike's at Snowshoe Thompson's 1219 Emerald Bay Road. Welcome to Mountain Mike's Tees and Skis and Snowshoe Thompson's. One location: 1219 Emerald Bay Road. We are South Lake Tahoe's Premier Ski and Snowboard Rental Shop. Mike and The Crew have been providing the highest quality service since 1998! Our fast, friendly and knowledgeable staff will get you in and out and on the slopes in minutes. 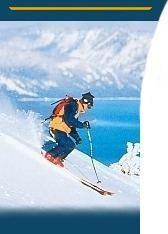 We have winter sports equipment rentals at the lowest prices in town. SKIS, BOOTS, POLES $25 a day. SNOWBOARD AND BOOTS $25 a day. SNOWSHOES $16 a day. No reservations needed. OUR LOCATION AT 3979 Lake Tahoe Blvd is CLOSED. We've consolidated into one shop, at 1219 Emerald Bay Road, South Lake Tahoe. We have a selection of Lake Tahoe T-Shirts, Hoodies and fleeces, at very cheap prices. Plus Lake Tahoe Souvenirs. We also have many chainsaw carved bears, in our front yard, carved by The Bear's Den, all for sale at our shop. On Hwy 50, South of "The Y"
close to Ernie's Coffee Shop. Look for the Bear Carvings, outside our Rental Shop.